Welcome back to the -EST Blog! This is where we explore some of the astronomical superlatives that go the extra distance to make our universe so interesting. This time, I’ll be trying to tackle one of the brightest objects that we can see. We’re going to talk about Active Galactic Nuclei. These objects make up more than half of the bright objects we see when we observe the universe in high energy gamma rays. I talked with Dr. Dave Thompson about his work studying active galactic nuclei and why studying them is important. So what are active galactic nuclei? An active galactic nucleus (AGN for short) is a small region at the center of a galaxy that is much brighter than it would be in an average galaxy. A galaxy that holds one of these active nuclei is known as an “active galaxy.” The artist concept above show what these galaxies might look like up close. The active regions at the centers of active galaxies are believed to contain black holes that are millions or billions of times the mass of the sun – supermassive black holes. Our Milky Way galaxy has one of these supermassive black holes at its center, but our galaxy is not an active one. Active galaxies require that gas and dust are in the act of falling into the black hole and glowing brightly on the way in. The Milky Way isn’t currently doing this and when material isn’t falling into the black hole, it simply sits. We don’t see the area right around the black hole in the center of our galaxy because there isn’t any glowing material so there’s nothing that we can see (this is the case with other galaxies that are not “active” as well). So we study the active galactic nuclei of other galaxies where the central supermassive black hole is busy consuming the gas and dust around it. There are three important features of AGNs: the black hole, the accretion disk, and the jets. 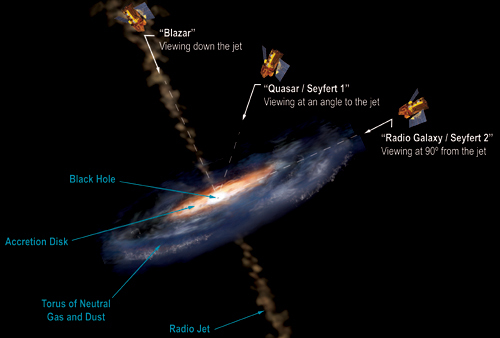 The black holes at the center of an AGN are the engine that drives the whole process. These black holes can weigh up to millions or billions of times the mass of the Sun. Because of their incredible gravitational strength, they feed on anything that happens to get close enough. This brings us to the second feature – the accretion disk. In the standard model of AGN, cold material close to the central black hole will form into a disk. As this matter spirals in closer to the black hole, it will heat up, causing the particles in the disk to emit their extra energy away in the form of light. This light can be in the wavelengths that we could see with our eyes, up through ultraviolet, even as high as X-rays. 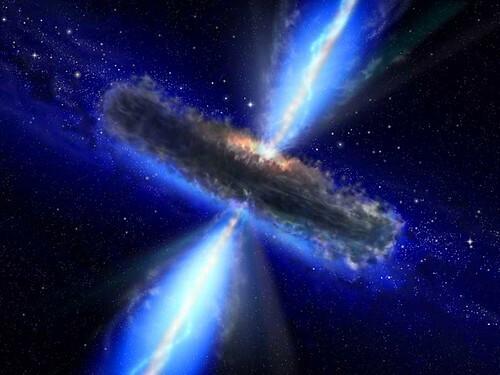 Occasionally, through a crazy twist of physics (that isn’t entirely understood yet), some of the material in the accretion disk will get thrown out into jets, the third feature of AGN. Many accretion disks produce jets which are two columns of charged particles flying away from the accretion disk at extremely high energies. One interesting thing about AGN is that they can look different depending on how we see them as the image above illustrates. If we see them edge on, with the jets flying out at 90 degree angles from our line of sight, that is known as a Radio Galaxy. In the configuration of the image above we can’t see the area right around the black hole because the accretion disk blocks it from our view. If we see the AGN at an angle, where we can see the accretion disk right around the black hole, it’s called a quasar. And finally, if, from our perspective, our telescopes are staring right down the jet, it is known as a blazar. This third view of AGN are the types of observations that Dr. Thompson studies, trying to gain greater understanding of how they work and what they can tell us about our universe. Dr. Thompson studies the particles that the jets from the AGN throw in our direction. He studies how the energy in the jets changes over time, looking for clues as to what these changing energies can tell us about what is going on in the area right around the supermassive black hole. 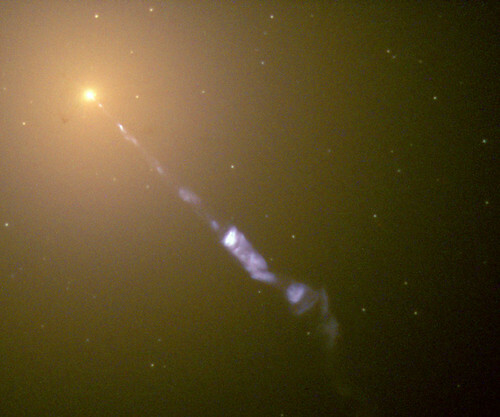 These jets, like the one in the image below (the blue streak), are very energetic and are made up of charged particles. Scientists are still trying to solve the mystery as to how these particles are being thrown out from the accretion disk at such high energies. The energies of the particles are so high that they can’t possibly come from material being heated, so something else much be going on. But what? Astronomers are still devoted to the mystery and hope to have an answer some day. But people might ask, “who cares?” I asked Dr. Thompson this question – why should we care about some bright thing that’s far away? His first response was that we never know what the pursuit of knowledge will lead us too. He told me about Einstein’s theory of general relativity. To most people, this is a scientific concept that they think they will never encounter. However, a lot of us have become lost without our GPS systems in our cars or phones. These GPS systems make use of a network of satellites that orbit the Earth. Because the gravitational field is different for these satellites, time passes for them differently. If scientists didn’t account for the general relativity consequences, these satellites couldn’t function, and neither would GPS. On more of a character note, Dr. Thompson also said, “Curiosity makes us human” and it makes us special. We ask questions and we try to find the answers, even if it’s difficult. “If we stop being curious then we are being less than we can be,” he continued. Dr. Thompson then told me about how these AGN affect the entire galaxy that they are a part of. How does energy and influence travel that far? We don’t know yet, but we want to. “This is how the universe works. It’s how the universe evolved and helped to make it what it is today.” So let’s keep asking questions and trying to figure out how our universe works! Thanks for visiting the -EST blog! Check back again soon when I attempt to tackle the opposite of the brightest objects in our universe by focusing on the darkest.